The Groove is a Mono sink mixer with an adjustable spray nozzle with 14cm hose which connects to a clip when not in use. The function is controlled by dual lever heads. Q. how do you change from spray to normal flow? Hi Mary, this is a one function spray, so unfortunately you cant change the type of flow. If you would liek to discuss alternatives, please email info@victorianplumbing.co.uk with your question and we would be happy to look into it for you. Thanks! Hi, the Mayfair Groove Mono Kitchen Tap comes with flexi tails, and the diameter of the main body of the tap is 55mm. Hope this helps. 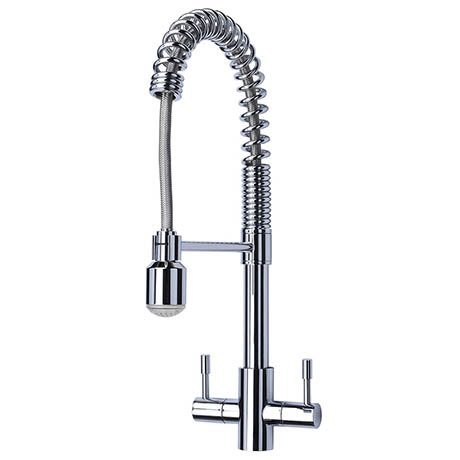 Hi, the Mayfair Groove Mono Kitchen Tap comes with an adjustable spray nozzle with 14cm hose which connects to a clip when not in use. It will adjust from normal flow to spray. Hope this helps! The Mayfair Groove Kitchen Tap requires a water pressure of 0.5-6.0 Bar. So as long as your water pressure is no lower than 0.5, the Groove Mono Kitchen Tap will perform well in your home. Hope this helps! Q. How wide is the spray pattern, would it be tricky to fill a kettle? Q. What size hole does this tap require? The product was clearly explained with all measurements given on the website. Delivery was quick and efficient. Great service. This is a great tap, we've fitted it in our kitchen and are really pleased with it. It looks a lot more expensive than it was and both my plumber and builder couldn't believe the price i'd paid. The spray flow is really good for cleaning things and it's easy to remove and replace from/to the stand. Delivery and service from Victorian Plumbing was excellent with the tap arriving quicker than expected.